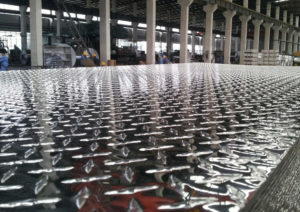 Aluminum tread plate also called aluminum checker plate or aluminum diamond plate. It is very popular in recent years either in construction or industrial manufacturing. The applications of aluminum tread plate are pretty vast, mainly used as anti-slippery things. As there are more and more aluminum tread plate in markets, how to protect or maintain it could be a problem. haomei Aluminum is a leading aluminum tread plate manufacturer in domestic with 18 years experience, and will explain how to maintain aluminum tread platefrom professional views. 1. When cleaning aluminum tread plate, we should clean it from top to bottom, from edges to center. This procedure must be followed, or else there might be do damages to your products. 2. Generally speaking, the chemical properties of aluminum product are unstable, so we must pay attention to choose the neutral detergent instead of acid or basic. Thus, we can avoid damages or corruptions to aluminum tread plate. Then how to figure out the detergent is appropriate to use? We can put the detergent and some aluminum product together to see if there are any changes. In this way, we can decide whether to use this one or not. 3. During the washing process, we should also pay attention to cleaning tools. Do not use tools, such as steel wire ball, that as high strength in case of damage aluminum tread plate. haomei aluminium recommends that rail type standard window cleaning machine would be a wise choice. 4. After cleaning of aluminum tread plate, we’d better ventilate. If we leave it wet in the air for too long, the surface of aluminum tread plate might be oxidized. An oxidized film will occur on hr surface. Thus, it will cause rough surface and darker color of aluminum tread plate. Then the appearance of tread plate can be influenced. This entry was posted in Aluminium Tread Plate and tagged aluminum plate, Aluminum Tread Plate, How to Protect Aluminum Tread Plate?, Tread Plate. Bookmark the permalink.